Nervous, stressed-out horse? Your solution is here! 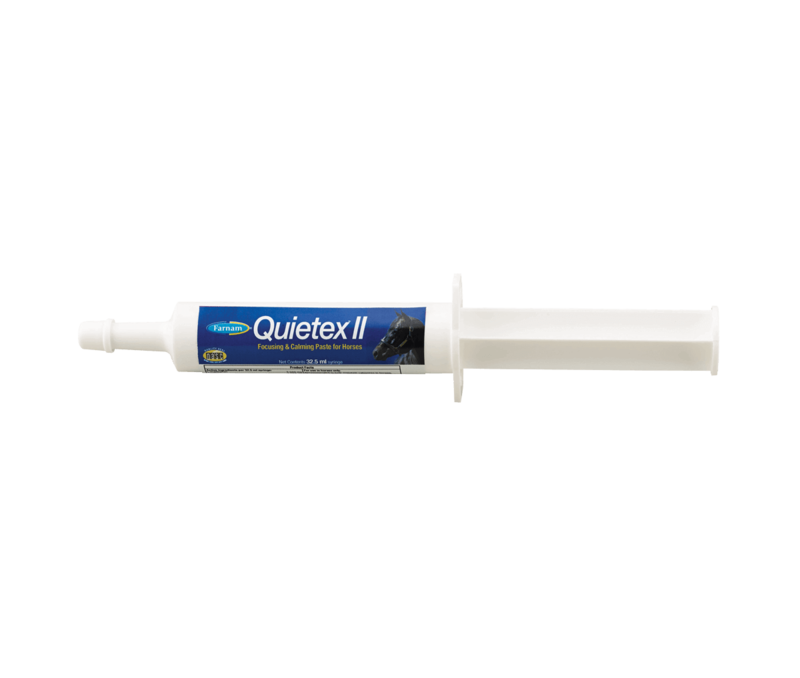 Quietex™ II supplement helps your horse be calm, focused and aware. This trusted formulation of stress-relieving ingredients calms without drugs. *Check with your association for testing rules and regulations. Chill Out! Does Your Horse Need A Calming Supplement? Administer contents of syringe directly into horse’s mouth and when possible to the back of tongue. For Performance Horses: 1 full syringe 2 hours before training or competition or as regulations allow. For Transporting Horses: 1 full syringe 2 hours before loading and 1 full syringe every 8 hours if transporting is prolonged. Enclosed scoop holds 1 ounce. Give 1 scoop daily per horse, regardless of body weight. For Performance Horses: Give 1 scoop one (1) hour before training or competition or as regulations allow. For Transporting Horses: Give 1 scoop two (2) hours before loading and 1 scoop every eight (8) hours, if transporting is prolonged.